Plans for a new elevated walkway began after destruction of the old wooden walkway during Hurricane Sandy in October 2012. 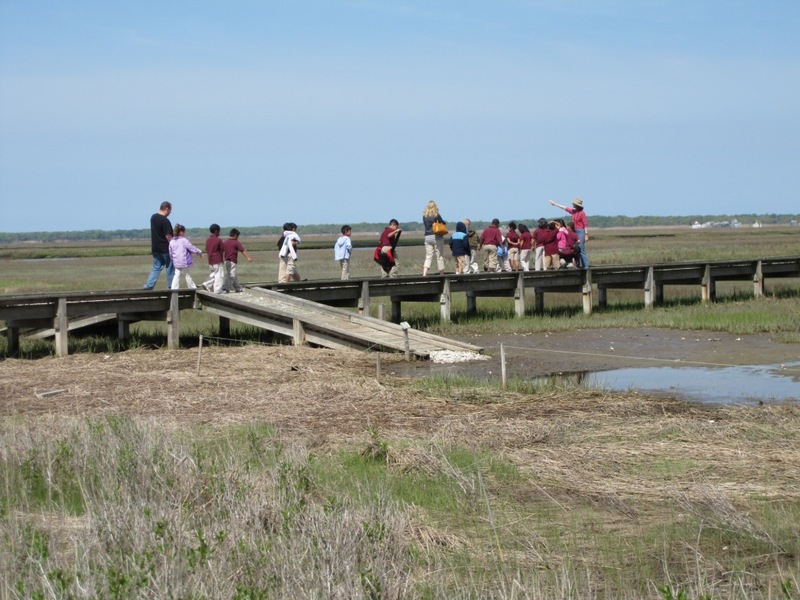 Reconstruction was an opportunity to rethink the possibilities for the walkway and reposition it for improved access to the marsh for both research and education. Construction was completed over the winter and early spring 2014 and the walkway was open to the public in mid-May. 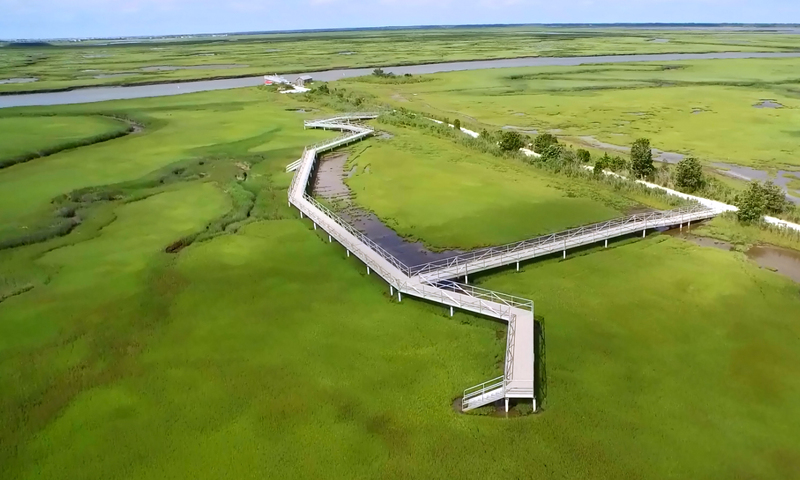 The walkway design and construction was carefully conceived to balance providing access to the marsh for visitors to learn about the marsh ecosystem without impacting the fragile ecosystem. It was also designed to be more resilient to storms and rising sea level – two important factors. 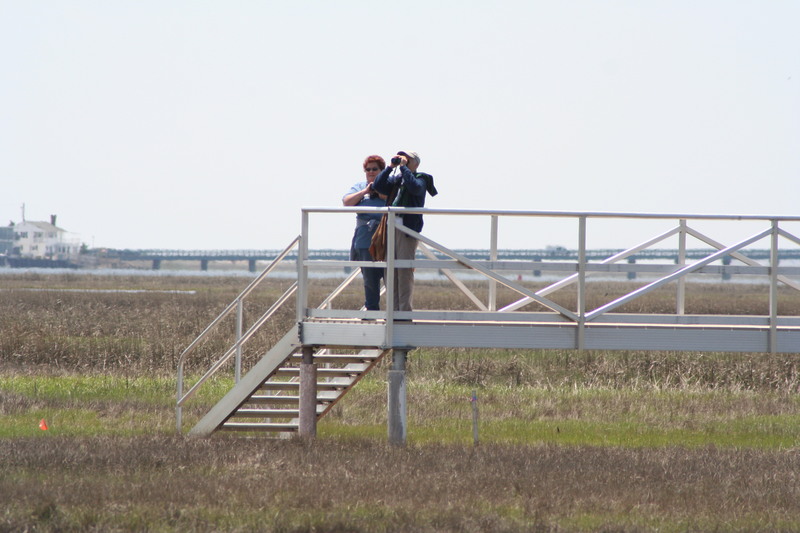 The winter construction was designed to cause minimum impact to marsh grasses that are dormant through the winter and to minimize disturbance to birds and animals that use the marsh during migration stopovers and for the nesting osprey. The walkway is a 720 foot long loop with an extension for better viewing of the front salt panne. The walkway can be accessed by ADA compliant ramps at two locations from the Institute’s shelled nature trail during Institute business hours. The walkway stands 4 ft from the marsh at its base and is 6 ft wide. Aluminum railings line the elevated walkway, ramps, and stairways for safety. Two sets of stairs allow restricted access for Institute personnel leading research and education programs. 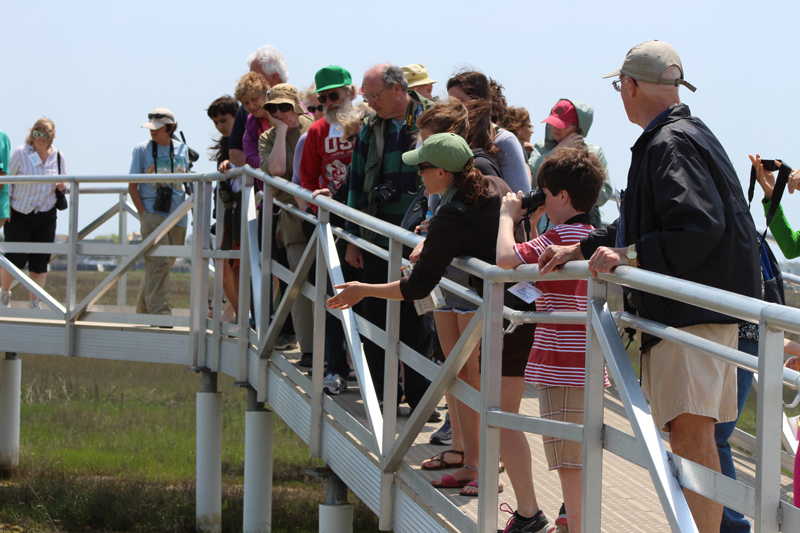 Research and education stations on the new elevated walkway provide for improved access to the marsh for biological and environmental sampling and hands on learning opportunities. The walkway is constructed using state-of-the-art methods, is sustainably constructed and utilized local contractors and locally sourced material to the extent possible. The walkway utilizes a steel helical pile construction. Piles were cork-screwed into the marsh and extend on average 30 feet below the marsh surface until they reached a lower compact sand layer. The main walkway structure was locally fabricated and is aluminum. The grated surface is polycarbonate and is specially designed to allow sunlight and rainwater to reach the plants and animals below and reduce the overall impact to the marsh. Since water can flow through this surface, the walkway has a better chance at surviving major flooding events and storms. Because the entire structure is metal with polycarbonate, there is no lift associated with flooding, making likelihood of damage during rising water levels in storms less. The entire structure can be recycled – if ever necessary. 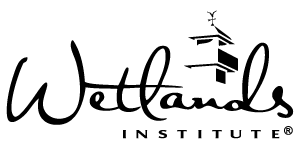 The project was designed and executed to impose minimal impact to the salt marsh. The salt marsh vegetation is growing back very well and should fully recover in the coming weeks. There are two areas with more impact. Institute staff and volunteers are planting 15,000 plugs of Smooth Cordgrass (Spartina alternaflora) in disturbed areas by late-May. All work on the marsh required the use of matting to distribute the weight of heavy equipment and prevent rutting. Decking was installed in 40 ft’ prefabricated sections to increase the speed of installation and decrease time on the marsh. 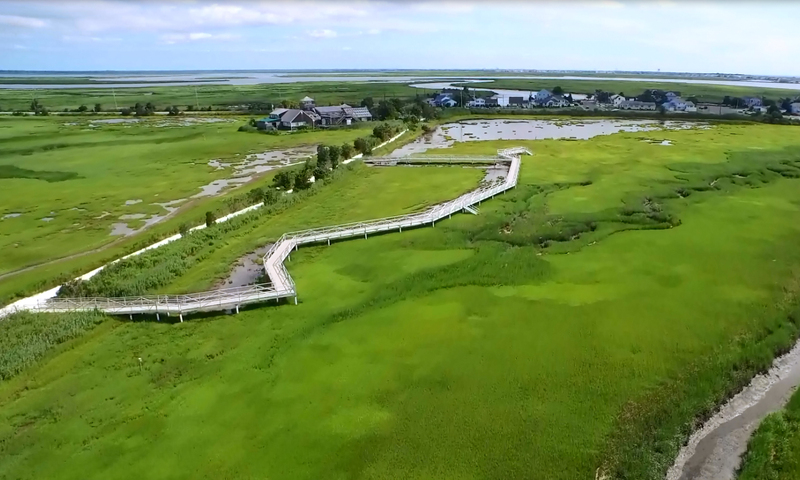 Nearly 90 – 2 7/8” helical steel pilings were installed for a small footprint and strong hold in the marsh. Surveys and boring tests of the marsh were conducted in advance to determine piling locations and elevations. 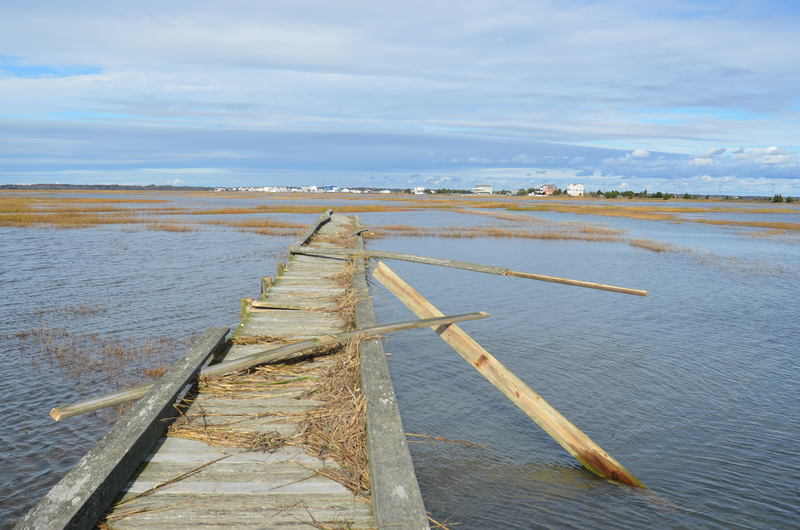 The costs of the new walkway are covered in part by a FEMA Disaster grant following the destruction of our previous walkway during Hurricane Sandy in October 2012. Remaining costs will be funded through donations. All necessary permits were obtained and have all conditions of the permits have been met. Pilings were in place before March 15, as a condition of NJDEP permits. 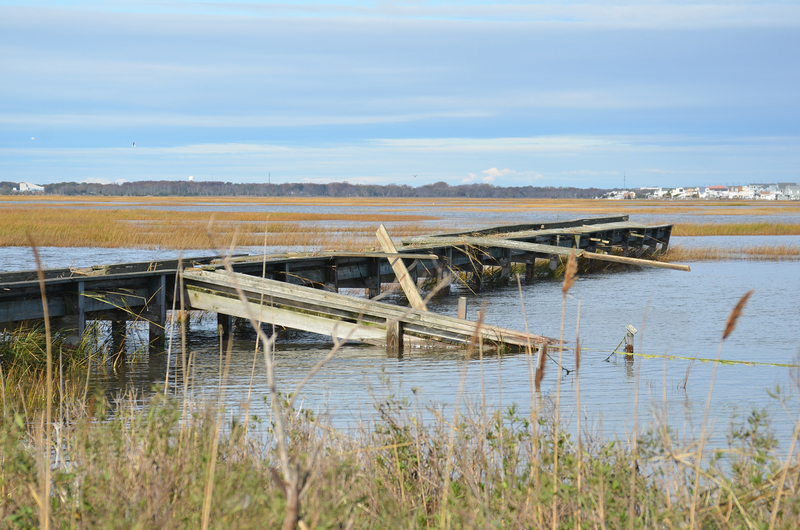 The old boardwalk was removed in early 2014, also as per permit. 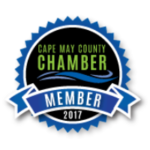 Contractors (NJ based, and all in 2 county area): Titan Shoring and Construction (construction), Dixon and Associates (engineering), Blue Water Welding (fabrication), The Lomax Consulting Group (environmental review and compliance).